Ella Mae is used to wearing her cousin's hand-me-down shoes—but when her latest pair is already too tight, she's thrilled at the chance to get new shoes. But at the shoe store, Ella Mae and her mother have to wait until there are no white customers to serve first. She doesn't get to try anything on, either—her mother traces her feet onto a sheet of paper, and the salesman brings them a pair he thinks will fit. Disappointed by her treatment, Ella Mae and her cousin Charlotte hatch a plan to help others in their community find better-fitting shoes without humiliation. Eric Velasquez' realistic oil paintings bring life to this story of a young girl's determination in the face of injustice. The book includes an author's note from Susan Lynn Meyer, discussing the historical context of the story and how the Civil Rights Movement worked to abolish unfair laws like the ones Ella Mae encounters. A 2016 NAACP Image Award Nominee, and a Jane Addams Children's Book Award winner. 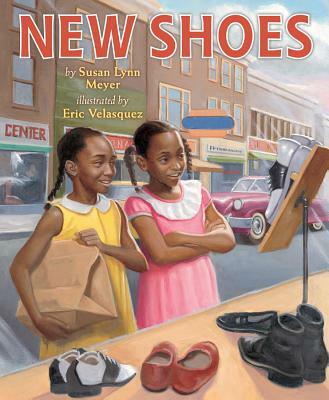 Susan Lynn Meyer is a professor of English at Wellesley College and an award-winning author of two books for children. Eric Velasquez is the illustrator of Ol' Clip-Clop: A Ghost Story by Patricia C. McKissack. His honors include the Pura Belpré Book Award, the Carter G. Woodson Book Award, and the Coretta Scott King-John Steptoe Award for New Talent.